The Designed for Life framework is based upon two fundamental values: Built to Last and Designed to Evolve. Under these two over-arching values, the following eight tenets comprise the full DFL business framework. Built to Last means exactly that—a product that lasts the adult lifetime of at least one generation. Planned obsolescence, though profitable in the past, is an unsustainable approach. Quality items may cost more up front, but they are well-made and suited to replace inferior purchases. In the long run, this approach is more economical, more competitive, and, ultimately, category-dominating on a market-share basis. Selling something is a promise. We trade money for utility. A Designed for Life product is good enough to include a guarantee that it will last a lifetime. This guarantee puts the onus on the company to make sure that their design lives up to this high standard and makes reliability and quality a top priority, from the design-concept phase, to the delivery of goods. If an item cannot be maintained in part, or in full, then it is likely to meet its demise much sooner than it should. Designed for Life products are thoughtfully engineered from the outset with standardized parts and replaceable components to make restoring, repairing, or even upgrading easy and desirable. For most businesses, sustainability refers to raw-goods sourcing, manufacturing, chain-of-supply traceability, distribution, and delivery methods. The same holds true within the Designed for Life vision, but reaches further to require that the finished product can actually sustain its usefulness for a lifetime. Rigorous design pays off. If you don’t love it, you won’t keep it. Classic and endearing design aesthetics are a hallmark of the Designed for Life approach. Fads, trends, or limited editions are incorporated in transient and changeable elements only, shaping a core product that is timeless, reliable, and enduring. 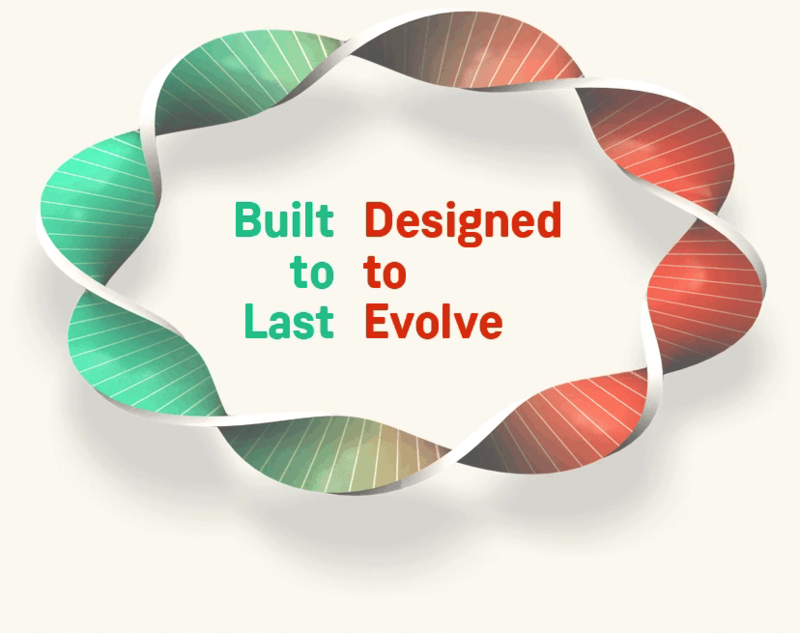 Designed to Evolve represents our credo to value products that adapt to change. People change in circumstance, tastes, and desires, so should the stuff we buy. This Darwinian quality extends to not only the functionality of the product itself, but to its place within its competitive category. Such projects, over time, are expected to rise to become the “apex predator” of their respective marketplace by means of their superiority and practicality. A Designed for Life product expands, contracts, divides, or can be reconfigured to accommodate the needs of real people, as they change, relocate, and live. Life changes, and the products that support our lives should change with us. Tastes and styles evolve. A well-conceived product meets not only functional needs, but aesthetic demands. The ability to change or modulate its outward appearance in simple, user-friendly ways is a quality that extends the usefulness of a product by mitigating obsolescence and fashion risk. The ability to add features after purchase is another step in extending a product’s lifespan. Additions and accessories should be both forward and reverse compatible, allowing consumers to improve their purchase in ways they might not have even conceived of at the outset. This concept drives innovation—bound by the constraints of the original core value proposition. Upgradeable features and functionality eliminate waste and unnecessary costs. Good products are designed with the end in mind. Ideally, that end is a long time away, at least for the core of the product. Accessories or replaceable parts should be designed to take advantage of existing or proprietary means for recycling, repurposing, or even peer-to-peer trading. When it comes time to finally say goodbye to a product, the landfill should be the last place it winds up having been designed with an end-of-life plan in mind.